Racing finally got underway for the BVI Sailing Festival with a 30 mile race around Virgin Gorda. A 15-knot easterly breeze with flat water provided perfect sailing conditions for the fleet. First away was Peter Aschenbrenner's 63ft trimaran Paradox with round the world multihull sailor Cam Lewis calling tactics. 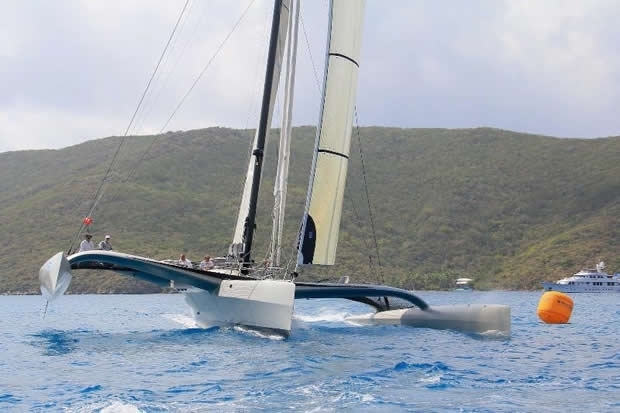 The ballistic multihull was first to finish by some distance, completing the course in an elapsed time of three hours, nine minutes and six seconds, just 13 minutes shy of the course record set by Swan 82 Virago. Paradox owner, Peter Aschenbrenner comes from San Francisco, but he has an international crew on board from America, Britain and France. "We sail just six up, as Paradox has power assisted winches and hydraulic systems," commented Aschenbrenner. "This is my first trimaran but I have been sailing skiffs for a while. I knew the designer Nigel Irens as a friend and I love asymmetric sailing and going fast! It would be nice to see other trimarans come here for the Festival. There are many multihulls in the Caribbean and the BVI is such a great place to come sailing. Today, I especially enjoyed the reach past Necker Island, really enjoyable, fantastic sailing." Neil Harvey's Dufour 425 Acadia led the bareboat fleet from start to finish. In a highly competitive start, Acadia port tacked the entire flotilla. Once in clear air their advantage was magnified by a lift onto starboard tack and Acadia looked to have got away to a winning lead but were destined not to even make the top three. Dufour 405, Team Trolly Car sailed by Bill Petersen and Peter Stazicker corrected out to win by just over two minutes from Leonard Nekeman's Lucky Dutch, (who were spotted in the Bitter End grocery store purchasing a case of Heineken prior to the race!). Timen van Elst's Sunsail 44i BK Grondlogistiek was third by just 24 seconds. In the Cruising Class, Stephen Schmidt's Santa Cruz 70 Hotel California Too, put in an impressive performance to take monohull line honours. But there was a long wait to decide the winner of the Cruising Division on handicap. Alain Fougere's J/160 Avatar corrected out to win the class but had to wait close to an hour to be sure of the win. Thomas Mullen's J/95 Shamrock VII was a desperately close second by just a minute with Hotel California Too in third. The Racing Class start was an intense affair. A dog-fight kicked off between several boats in the starting sequence. Molto Bene was called back on an individual recall but returned to start correctly. Stefan Lehnert's Tripp 57 Passion 4C made a conservative start, but got away well. Notably Passion 4C held their genoa through the lee of Prickly Island and stayed high rather than going for an early hoist. Michael Shlens' Farr 400 Blade went for an earlier spinnaker and looked to have caught a hyper-gust, which knocked them sideways. Global Yacht Racing's First 44.7 skippered by Marcus Chollerton-Brown put in an impressive performance to finish fourth in the Racing Class, especially as this was the first time the team from the Manhattan Yacht Club had ever raced the yacht. The Prize Giving at The Crawl Pub, Bitter End was a lively affair thanks to Gold Sponsors, Heineken and Mount Gay Rum. John Glenn, VP of sales and marketing for the Bitter End Yacht Club announced the winners and thanked the competitors for coming to what has been a very enjoyable stay in the out of this world surroundings of the North Sound. The overall winner of The Bitter End Cup was awarded to Team Trolly Car, much to the delight of Donna Jo Petersen, who was also celebrating her birthday on board. "It has just been a fantastic day, the guys worked so hard and we had a tremendous battle with Acadia but to win on my birthday with my son, husband and old friends on board was a dream come true, it just doesn't get better than that,"
Racing concludes tomorrow with the Nanny Cay Cup, the first warning will sound at 1000 and a prize giving will be held at the Nanny Cay Marina in Tortola.